Enjoy the fishing, beaches and quiet lifestyle of the Mackay region - camping is a great way to enjoy the natural beauty of the area. 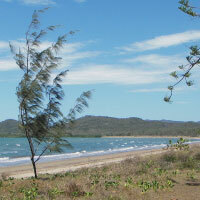 Mackay Regional Council operates camping reserves at Seaforth, Ball Bay and St Helens Beach, located in some of the region’s most picturesque settings. Seaforth - booking office located on site, alternatively phone 0427 373 358 or (07) 4966 4359 to make a booking. St Helens and Ball Bay - attendants visit site daily to collect fees.